I think this idea is the best and if I knew Alice from futuregirl.com personally I would definitly ask her for one. 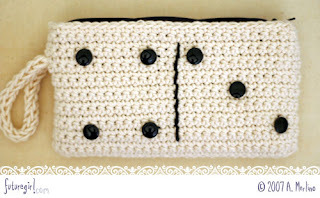 This would be the best gift for an expectant Mom who will be destined to carry a diaper bag for the next few years. How great would it be to have a wristlet. You could carry it in your diaper bag and leave the diaper bag with the sitter or the nursery at church and take your things with you.